The end of the American Revolution unleashed a westward migration that lasted for over a hundred years. The western regions of former colonies such as New York were now the new frontier. It was here that America's newly minted citizens looked to acquire land upon which they could exercise their rights of liberty and the pursuit of happiness that they had just fought a revolution to obtain. The land was untamed wilderness. There were no roads, no pastures, no fields and no homes. Everything that the settlers needed to survive and thrive had to be carved out of the backwoods through back-breaking effort. Undeterred by the daunting task, would-be settlers enthusiastically bought up homestead plots from land speculators eager to cash in on the passion to move west. William Cooper typifies these land speculators. A resident of New Jersey, Cooper was able to purchase forty thousand acres of land near Albany, New York in 1785. The extraordinary demand for land was underscored by the fact that Cooper was able to sell all of his property within sixteen days. He did this by dividing his land into small plots and selling these to what he described as "the poorer class of people." It was the first western settlement established after the Revolution. 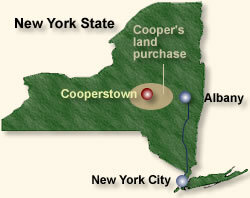 Cooper joined the settlers, laid out the boundaries of a village � Cooperstown � and expanded his holdings by purchasing adjacent lands. It was a rough existence. At one point the settlement almost succumbed to starvation. However, the settlers persevered, overcame their difficulties and prospered. "Many were reduced to such distress as to live upon the roots of wild leeks . . . "
In May, 1786, I opened the sales of forty thousand acres, which, in sixteen days, were all taken up by the poorest order of men. I soon after established a store and went to live among them, and continued so to do till 1790, when I brought on my family. For the ensuing four years the scarcity of provisions was a serious calamity; the country was mountainous, and there were neither roads nor bridges. But the greatest discouragement was in the extreme poverty of the people, none of whom had the means of clearing more than a small spot in the midst of the thick and lofty woods, so that their grain grew chiefly in the shade; their maize did not ripen; their wheat was blasted, and the little they did gather they had no mill to grind within twenty miles distance; not one in twenty had a horse, and the way lay through rapid streams, across swamps, or over bogs. . . I resided among them and saw too clearly how bad their condition was. I erected a storehouse and during each winter filled it with large quantities of grain, purchased in distant places. I procured from my friend Henry Drinker a credit for a large quantity of sugar kettles; he also lent me some potash kettles, which we conveyed as we best could, sometimes by partial roads on sleighs, and sometimes over the ice. By this means I established potash works among the settlers and made them debtor for their bread and laboring utensils. I also gave them credit for their maple sugar and potash, at a price that would bear transportation, and the first year after the adoption of this plan I collected in one mass forty-three hogsheads of sugar and three hundred barrels of pot- and pearlash, worth about nine thousand dollars. This kept the people together and at home, and the country soon assumed a new face. I had not funds of my own sufficient for the opening of new roads, but I collected the people at convenient seasons, and by joint efforts we were able to throw bridges over the deep streams, and to make, in the cheapest manner, such roads as suited our then humble purposes. In the winter preceding the summer of 1789, grain rose in Albany to a price before unknown. The demand swept all the granaries of the Mohawk country. The number of beginners who depended upon it for their bread greatly aggravated the evil, and a famine ensued, which will never be forgotten by those who, though now in the enjoyment of ease and comfort, were then afflicted with the cruelest of wants.
. . . Many were reduced to such distress as to live upon the roots of wild leeks; some more fortunate lived upon milk, whilst others supported nature by drinking a syrup made of maple sugar and water. The quantity of leeks they eat had such an effect upon their breath, that they could be smelled at many paces distant, and when they came together, it was like cattle that had pastured in a garlic field. A man of the name of Beets, mistaking some poisonous herb for a leek, ate it, and died in consequence. Judge of my feelings at this epoch, with two hundred families about me and not a morsel of bread. A singular event seemed sent by a good Providence to our relief; it was reported to me that unusual shoals of fish were seen moving in the clear waters of the Susquehanna. I went and was surprised to find that they were herrings. We made something like a small net by the interweaving of twigs, and by this rude and simple contrivance we were able to take them in thousands. In less than ten days each family had an ample supply with plenty of salt. . . This was the first settlement I made, and the first attempted after the Revolution; it was, of course, attended with the greatest difficulties; nevertheless, to its success many others have owed their origin. It was besides the roughest land in all the state, and the most difficult of cultivation of all that had been settled; but for many years past it has produced everything necessary to the support and comfort of man. It maintains at present eight thousand souls, with schools, academies, churches, meetinghouses, turnpike roads, and a market town. It annually yields to commerce large droves of fine oxen, great quantities of wheat and other. grain, abundance of pork, potash in barrels, and other provisions; merchants with large capital and all kinds of useful mechanics reside upon it; the waters are stocked with fish, the air is salubrious, and the country thriving and happy. When I contemplate all this, and above all, when I see these good old settlers meet together and hear them talk of past hardships, of which I bore my share, and compare the misery they then endured with the comforts they now enjoy, my emotions border upon weakness which manhood can scarcely avow." This account appears in: Cooper, William, A Guide to the Wilderness; or the History of the First Settlements in the western counties of New York (1810, reprinted 1949); Taylor, Alan, William Cooper's Town (1995). "Building America, 1789" EyeWitness to History, www.eyewitnesstohistory.com (2008). 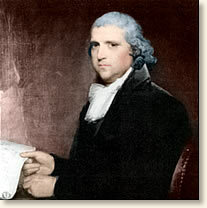 William Cooper was the father of James Fenimore Cooper, author of numerous novels including The Last of the Mohicans. William Cooper died in 1809 in Albany, NY. He was 55 years old. Cooperstown, NY � the town that William Cooper founded - is the home of the National Baseball Hall of Fame.